In the last few months, I've been helping my clients improve & tweak their sales funnels. If we can improve the opt-in rate & that improves the conversion rate, then we can increase our ad budget & everyone is happy. This is a true win-win-win. 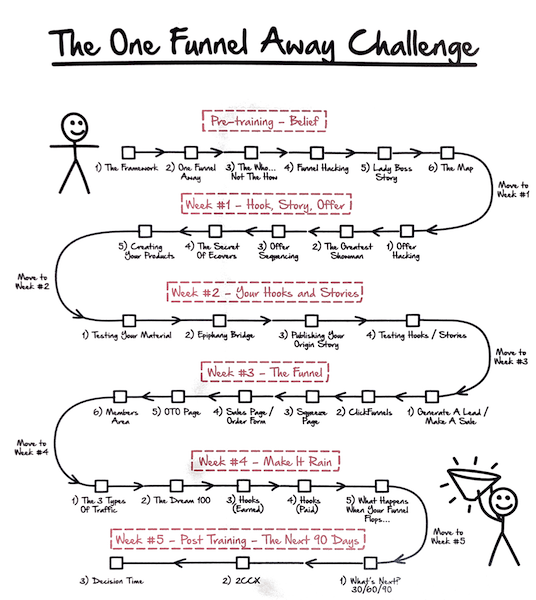 I always thought there should be a “funnel” training or a challenge for everyone who really needs “hand-holding” when it comes to building sales funnels & making sales. If you look closely at the “challenge” image above, you will see that the pre-training is the foundation and framework for building sales funnels. That sets you up for Week #1: Hook, Story Offer. The hook story offer is one of the most important tools you will ever use because the highest converting, biggest online businesses use the “hook story offer” method for generating sales. The Challenge starts next week, and if you go through our link, The Click Agency will throw in a few bonuses that are guaranteed to jump-start your business. Bonus #1: The Click Agency will review and improve your sales funnel that you build after you take The Challenge. Our on-staff copywriter will edit/tweak/write your headlines and benefits and call to actions. Bonus #2: We will design and place the advertising for you & run 100 clicks through your new sales funnel. That will give you a decent idea of your opt-in rate & your conversion rate. Bonus #3: My team will review & improve your follow-up process to increase your conversions. That way – you come out with a converting sales funnel, we can run advertising to & you start seeing real results. The Challenge starts next week. Once you get your funnels setup and running, please click the grey button to notify our team & claim your bonuses.